Show the ones you love how the Eucharist allows them to hold God's hand. Teach them that receiving Communion strengthens their relationship with God and that through this sacrament he opens the door to Heaven. Adults will also find their love of the Eucharist deepening as they share this beautifully illustrated book with loved ones. For many, the Eucharist embodies the essence of their faith, and yet, all too often, the act of receiving communion has become routine. We stand up on cue, approach the altar, receive the host, and continue on back to our pew. At times we may even choose to walk directly out the church doors without bothering to pray to the One we have received. Communion signals the end of our weekly duty; we have kept holy the Sabbath and now we can leave. 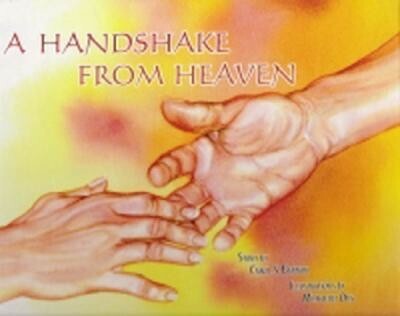 I'm the author/artist and I want to review A Handshake from Heaven.